Posted on April 2, 2018 by Jason K.
No one is perfect….we all make mistakes. The same goes for riders having a first-hand experience in the world of cycling. Let’s be honest, it’s hard to graduate to a seasoned rider without having made some cycling mistakes on the way. After all, it’s a learning process and mistakes are prone to be there, however common they are. But wait a second, you can keep these cycling mistakes to a minimum or totally avoid them if you learn from the mistakes of others, right? 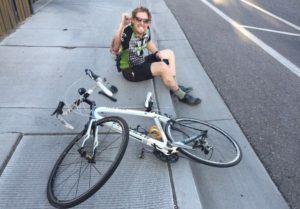 Well, I think this article on the common cycling mistakes made by beginners might be a good start for you. Sounds funny, right? On the contrary, this is a mistake that can lead to some serious cycling mishaps. I think you know a thing or two about losing some 500-600 calories in an hour or so of biking. Well, this gives you more than enough reason not to ride on an empty stomach. A simple breakfast or meal before the ride will give a boost of energy and probably keep you from fainting. But what if you’re just too lazy to prepare a meal or breakfast? In such a case, you can pack a bar of chocolate to keep up your energy, especially when doing long hours of riding. “Eating enough” and “eating too much” are two different things. I usually refer to the later as pigging out. Just imagine riding on a full stomach, don’t you think it feels uncomfortable? The situation gets even worse when riding a bike that puts you in a forward riding position. Again, let’s be honest, your protruding stomach won’t look good in that cycling jersey, will it? Well, I don’t have any jurisdiction to tell you what gear to purchase or even more, what to wear. But then, it doesn’t make sense to put on a cycling gear you’re not comfortable in, such as a tight-fitting jersey or over-sized helmet. On the other hand, you may be having the right gear for the ride. However, the way you put them on matters a lot. For instance, it just doesn’t feel right wearing a cycling suit on your helmet, does it? So get a riding gear that is of the right size, comfortable, and put it on the right way. The world is undergoing climatic change, and that’s a fact. The atmosphere of today is quite different from that a decade ago. It’s true that the sun’s rays give vitamin D. But then again, too much of it and you get skin complications. Therefore, the last thing you want is being exposed to harmful ultraviolet rays. Spare some cash for sunlight protection, such as sunglasses and sunscreens. In doing so, don’t forget to get the best products for the job. A small mistake might cost you a ride. That’s very true for those that forget to purchase a good bike lock. After all, stories about bikes getting lost aren’t just stories. You don’t want to lose a bike worth hundreds of dollars just because you forgot to purchase that 10-dollar lock, do you? Well, the comparison speaks for itself! So remember to get yourself a good lock and keep your bike locked when parked. Well, everyone gets lost sometimes – that can be excused. But it doesn’t feel right when it gets too much and becomes almost a habit. As a beginner, you’ll have quite a hard time getting to master roads and those local riding trails. So be sure to bring along some form of cycling computer with mapping capabilities. Sounds quite expensive for you? Well, there is a bunch of other less expensive alternatives, not to mention the one right in your Smartphone device – Google maps. Cycling is a fun experience. But get a punctured tire in the middle of nowhere and the fun experience turns sour. So that leads us to a couple of must-haves, namely spares and tools. However, don’t pack up a ton of items. Just get the essential spares and tools that will get you home safe and sound should you have a problem. Give priority to items, such as inner tubes, patches, mini pump, and a multi tool. The joy of riding can make us forget some very important things and the end result is frustrations. For instance, you get to purchase a bike only to find out later that the saddle is too high or too low for your size. That means that the power from your legs won’t be delivered as required. A good rule of the thumb is to test the bike and and ensure there’s a slight bend of the knee (around 20 degrees) when in pedaling position. But don’t be afraid to fine tune things if need be. You want to burn some calories, right? Well, that doesn’t give you a reason to push things harder. Packing a ton of stuff on your bike will do you more harm than good. Your bike also stands to loose in most cases of overloading. Take for instance, you and your stuff having a combined weight of 300 pounds on a bike rated for 250 pounds. The end result is quite clear – excessive stress on the frame hence shortened life. Loosing control and crashing is something that most riders have experienced, especially during those “try and error” moments. Ask the cause and most will tell you, “I tried to brake in a corner”. Well, to stay on the safe side, you need to brake before the corner and not when you’re on it. In doing so, make sure to brake gently and do it a little earlier in the case of wet conditions. These are the common bicycling mistakes that riders make when starting out. Now that you know, you have a great chance of avoiding them. After all, what you want in a ride is more fun and less mistakes. What’s more, the comfort and safety you’ll get is a reward in its own way.